The 1958-59 period is a vintage often associated with Gibson guitars, the Les Paul Standard in particular, as discussed in a previous article. But in Fullerton, California, Leo Fender was experimenting as well, albeit not as drastically; for possible cost-cutting or time-saving reasons, or simply just emulating the popular evolution of the Precision Bass a year prior, the traditional string-thru-body design of the Telecaster was foregone in favor of a top-loading bridge, with the string slots drilled thru the rear lip of the "ashtray" plate. 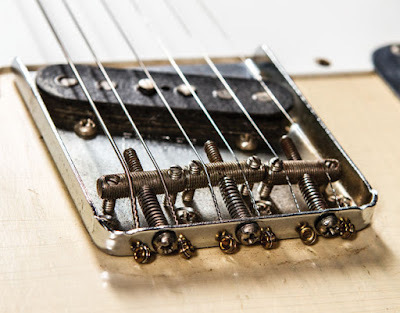 This began in late '58, and after a full year of production with mixed to negative results, the old string-thru-body construction was brought back by 1960, although the remaining supply of top-loading bridges were re-drilled and still used, allowing some models from late '59 all the way thru '62 to swing both ways. Why bring up such an obscure design failure? Because one of the most infamous Telecasters in rock-and-roll history was in fact a "toploader" from this period. 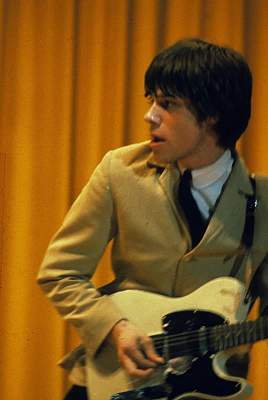 Beginning it's life as a white-blonde Telecaster with white pickguard (exact date of birth unknown, but the slab rosewood fingerboard indicates mid-'59 at earliest), it was purchased by John Owen in 1961, who sold the guitar to his friend, former Deltones bandmate and then-Yardbirds lead guitarist Jeff Beck in 1965, who used it as a backup to his beloved Esquire while on tour. When Page joined the Yardbirds in 1966, Beck presented the instrument to him as gift, a thank-you for recommending Beck for the Yardbirds gig in the first place, and for throwing him some session work as well. Jeff Beck playing the Toploader with the Yardbirds circa '65 (top & left), and Page with it in '66 (right & bottom). 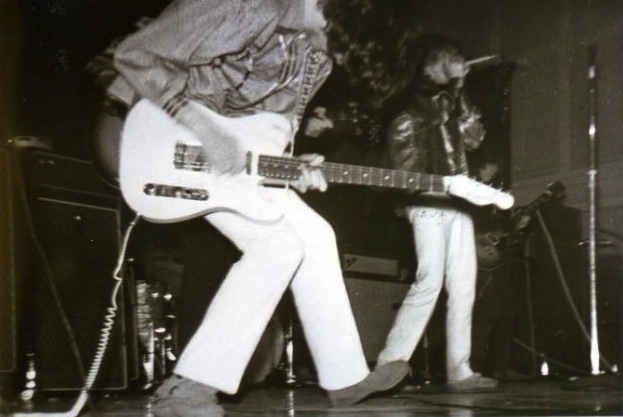 The guitar underwent a few cosmetic changes, from white pickguard to black with Beck, then back to white with Page, who also added a few circular mirrors for a psychedelic effect, perhaps as a tribute to friend Syd Barrett's Esquire, in '67. 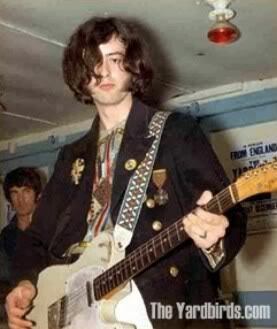 Page with the Toploader, circa '67. Eventually, by 1968, Page stripped the guitar to it's natural ash grain and had some fun with paint, adding a mirror pickguard as well; the "Dragon" was born. 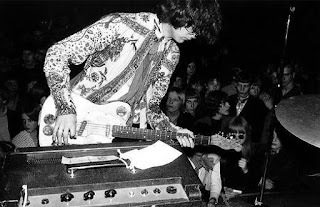 This was Page's main guitar during his time as lead guitarist of the Yardbirds, as well as the New Yardbirds, who would change their name to Led Zeppelin and record a crushing self-titled debut album released in January of '69. Along with a Supro combo amp, Vox wah, and Tone Bender fuzz, the Dragon helped Page create some incredible and timeless guitar tones on that record. 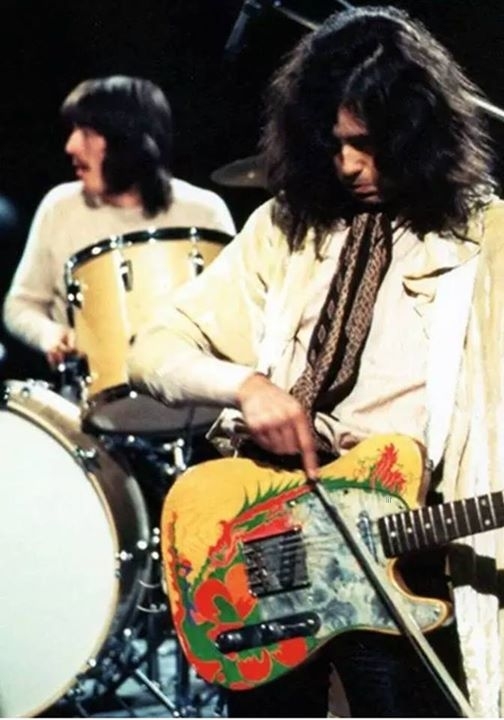 Page bowing Dragon on the first Zep tour, with Bonzo in background. 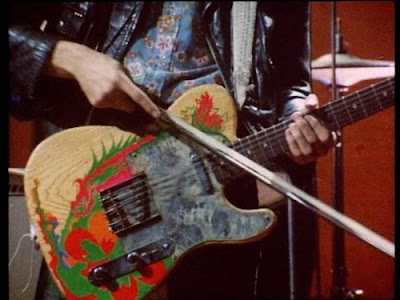 While also used for recording parts of Led Zeppelin II, the Dragon was last seen live in May of '69, only to be brought out of retirement to record the epic climactic outro solo of "Stairway to Heaven" in 1971. 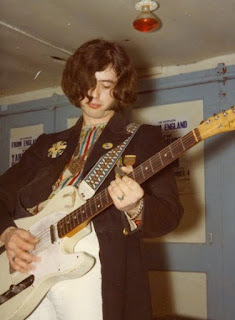 Unfortunately, while away on tour (and favoring his Les Pauls for live use), a friend thought he'd do Jimmy a favor by crudely refinishing the iconic guitar; the new paint job "totally screwed up the sound and wiring" according to Page, and he scrapped the guitar, salvaging just the neck and using it on his brown B-bender Tele later on. "As for the body", says Page, "it will never be seen again!". Did Jimmy prefer this Tele to others due to it's top-loading bridge? He never said publicly, at least not to my knowledge, but you've got to assume he had access to others and still went back to the Dragon. 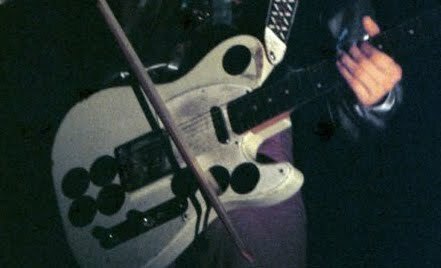 There are some reports that this guitar was drilled out for string-thru setup as well, meaning it would have been a very late '59 or even a '60 production model, but Page clearly strung it up thru the top of the bridge. In theory, and claimed to be true by some fans, the toploading bridge adds a looser, slinkier feel to the strings by eliminating the drastic breakpoint angle behind the saddles and the extra string length (not to be confused with scale length, which stayed the same); this would aid in ease of bending and vibrato, but hurt sustain and the ability to really "dig in" to the strings, the main complaints with the design in '59 and beyond. Most traditional Tele aficionados love the way the guitar fights back when you play aggressively with either hand, and that was diminished with the top-loader. I suppose none of that bothered Jimmy, though. Jim Campilongo with his '59 original (left) and playing his signature model. 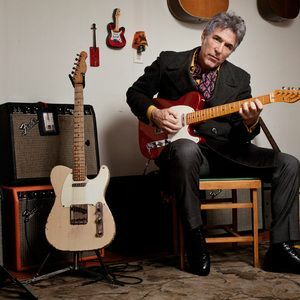 There's also a modern Tele-master who prefers the '59 Toploader, and it's someone I've had the privilege of seeing live and taking lessons from right here in New York City: alt-country/jazz/western swing guitarist extraordinaire Jim Campilongo. Jim was given his authentic '59 as a gift from a friend after falling in love with it, and it's been his main instrument ever since (I need some friends like Jim's). He describes the feel of the guitar as "rubbery" compared to standard Teles, but still capable of the twang reminiscent of his guitar idol, Roy Buchanan, and excelling at behind-the-nut bends due to it's extra slinkyness (something Page did as well, albeit not as extensively). Fender released a limited edition Custom Shop Campilongo model in 2010, an exact replica of his beloved '59, and I had the pleasure of playing Jim's personal copy. It was strung up with .009's, so I couldn't give a fair comparison to a standard Tele, as I'm a .010 player; one would need to go back-and-forth on virtually identical instruments with matching string gauges for a fair shootout. Regardless, it's a fine instrument worthy of the headstock signature. If you're not familiar with Jim's music, I suggest you check out Orange or Dream Dictionary, both excellent albums with some great guests, including Norah Jones. He's also a phenomenal teacher with some great online lessons available for download. And now, for the wild card... 24 years after the original Top-loader Telecaster, Fender brought the design back in 1983, now utilizing a Schaller "Freeflyte" top-loading bridge as opposed to a modified traditional-style unit. 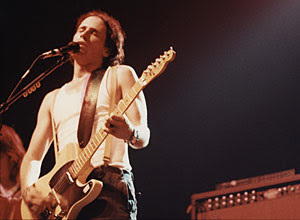 Although just as unpopular the second time around, especially due to a common complaint of microphonics in the bridge pickup, it became the main instrument of famed singer/songwriter (and hugely underrated guitarist) Jeff Buckley. Jeff Buckley's '83 Tele (left), and a closeup of the Schaller Freeflyte toploading bridge (right). Jeff borrowed the blonde mirror-pickguard instrument from his friend Janine Nichols in 1991, after all of his personal gear was stolen; he never actually purchased the instrument, but played it from then until his untimely death in 1997. 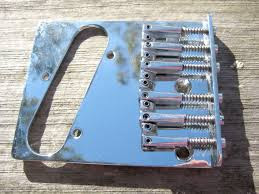 A Seymour Duncan Hot Stack replaced the stock bridge pickup, and the mirror pickguard was originally added by Janine as a tribute to Chrissie Hynde of The Pretenders. 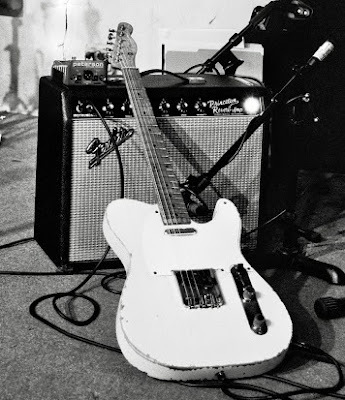 This Tele was used for the recording of Grace, Buckley's lone studio album, including his breathtaking version of Leonard Cohen's "Hallelujah", and also featured on much of Live in Chicago and Live at Sin-e. The guitar was returned to Janine after Buckley's passing, and auctioned off via Chelsea Guitars in 2011 for over $50,000. 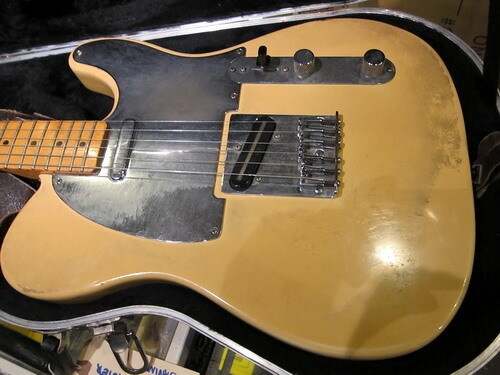 Fender only produced this Freeflyte-equipped model of the toploader through 1984, although some future versions of the instrument, like the Made-in-Mexico Classic 50's Tele, have featured variations on the toploading bridge since. It just goes to show that a universally unpopular design can still be magic in the right hands, regardless of style or era. One person's con might be another's plus. i just found your blog,i love to play guitar and you have shared great information about guitars andsound engineering,i really enjoyed reading it,keep it up. 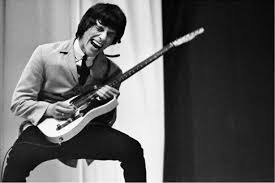 As a guitarist of considerable vintage and a long term lover of Tele's, I have owned quite a few, still own several, and have played many more. I own an 83' USA toploader in Sienna Burst (Serial No. E315642). I purchased the guitar in 1986. I am fortunate to own many fine guitars, quite a few of which are considerably more valuable than the toploader, but it is my favourite electric guitar. It is my standard "go to" electric for live gigs, for the studio, or for just noodling around at home. I love the slightly "slinkier" feel of the toploader, and I find that the shallower string bridge angle, tends to take the edge off the "ice pick through the brain" sharpness that "through-body" teles can generate. However, the most fantastic feature of the 83' toploader is the glorious 12" radius neck. This is the best neck ever put on any Fender, hands down - don't bother arguing with me - I'm right! It is so nice to play that it should be illegal. Many comments on the 83' toploader note the delicious neck pickup, and I totally agree. I changed the pickups for Texas Specials, but I still have the originals, and though the Special's are great, I'm considering refitting the original neck pickup. My toploader was butchered by an incompetent set-up/repair shop, and I have spent serious money having it repaired and restored. Note to other owners and set-up shops - be aware of the more complex "locking block" truss rod adjustment system on these guitars.